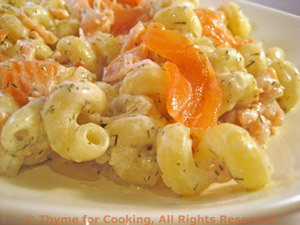 Pasta with Smoked Salmon, Thyme for Cooking easy gourmet dinner. We don't often use Crème Fraiche - a wee extravagance to go with the Smoked Salmon. Use yogurt if you prefer, or sour cream. I use crème fraiche for this. You can substitute sour cream if you like - it will be a bit more tart; or heavy cream - it will be a bit higher in calories, or Greek yogurt. 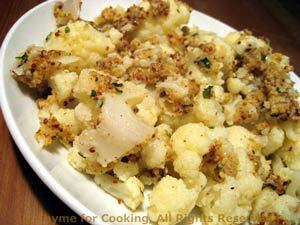 Thinly slice shallots and sauté in oil until tender. Stir in crème fraiche and heat through, do not boil. Add 3/4 of the salmon, dill and lemon juice to the crème fraiche. Heat through but do not let boil. Add pasta and toss well to combine. Put it into a serving bowl, garnish with reserved salmon and serve.